Could the curves effect draw itself in smaller sizes depending on the available panel space. Us single monitor types have only so much screen space and it is a valuable commodity. Viewer especially. The curves effect wants a lot of space for itself. So we would have to resize the panel to work on it and then resize back to reclaim screen space. Tedious. The curve can work with smaller sizes. One or two additional sizes, continuous resize or even manual size control. The link above shows all the things that you can hide or show to make visible in your work space, why can't we hide the media, text, effect panels? Certainly we should be able to hide the text panel. Especially given the NLE/editor timeline has no use for the text panel (as of HF2017). @Triem23 Proxy creation works in a similar(ish) way with no apparent problem: you start proxy creation then carry on editing until the point the proxy finishes and it simply swaps into place where the original file is referenced. It's seamless. Some kind of timeslicing manager to allow the foreground process to have access to enough CPU/GPU to be useful for editing would work around the more complicated projects that actually do need more CPU/GPU to render. You could have a slider to adjust the percentage amount to give to the Editing or the Exporting side. Then we wouldn't get so many "Why is my CPU at 15% and my GPU virtually idling when I export a hugely complicated project on this expensive rig I built to be as fast as possible?" posts. I'd like to put in a request for keyboard stroke movement of layers i.e. + for moving a layer ahead in time by one frame (or shift + for ten frames) and the same (but opposite direction) for the - key. Or something like that. It can make lining up audio and video, say after an import from Mocha, so much easier. 1. Transformation as separate effect (so I can add animated transformations to my effect presets). 2. Make playhead scrubbing independent from rendering. This will make Hitfilm look more responsive. Currently the playhead movement is affected by rendering performance. In Magix Vegas the playhead scrubbing / clip resizing is always smooth even when the preview window is lagging. What purpose is there to scrubbing a timeline without seeing the processing of effects? If you want to scrub without consideration of effects, disable the effects. I prefer a responsive timeline even if the viewer is lagging, it makes editing more pleasant for me. What you're showing may have a lot to do with your computer. If you have a less than optimal graphics card, low end processor and/or insufficient RAM, you could be having these very same problems. @ToddGroves It's not practical to turn off all the effects on many layers; whereas: it is practical to be able to scrub quickly to where you want to be, then play a specific section with them on. If you separate the playback from the playhead you can scrub more quickly. It's just as useful in a composite as it is in the Editor/Trimmer. As an addition to that: the ability to classify certain Effects as 'Optional when Scrubbing', such as Motion Blur, other Blurs, Glows, or perhaps Particles, or Grading Transfer, or a number of others that have a significant impact on playback speed (but also let people choose) and just aren't going to be seen anyway when scrubbing quickly through footage to find a specific part. This would greatly help with scrubbing speed in complicated comps and make help it play more smoothly if it could actually playback the remaining 50% of the effects in a comp at a faster speed. You could set a little tick box in the Effects list for an effect to be temporarily suspended when you scrub. What Effects am I using? b) to give you quicker access to those effects that you want to make 'Optional when scrubbing' to turn them off, or back on again. Allow SHIFT-Selection of multiple Effects to do this in blocks. Simplest method would be to use the normal Effects Panel, but type in a special Keyword into the Search field, like "@Used:[Comp Name]" to only show those use in a specific composite (name them uniquely to avoid confusion). Left blank, like "@Used:" it would list all the effects used in all the composites in the entire project. If this isn't in Hitfilm, I would love adding more compatibility with 3d model files, welcoming a variety of different types of 3d model files. I'd also love to have compatibility for different things like customized plugins, like 3d model epacks or different particle plugins, VideoCopilot style. @24kmoviemaker Hitfilm Pro (2017) can import models in 3DS, OBJ, LWO, ABC and FBX. What other formats would you like? Hitfilm Pro is OpenFX compliant and can take third party plugs including packages from NewBlue, Re:Vision, Red Giant and others. Hitfilm also has a preset system. Some starter particle setups can be found on the Hitfilm Preset Marketplace at Inscapedigital.com. Right now that involves digging through a Google Drive folder until Javert finds a better way to thumbnail. Free transform and content aware..? 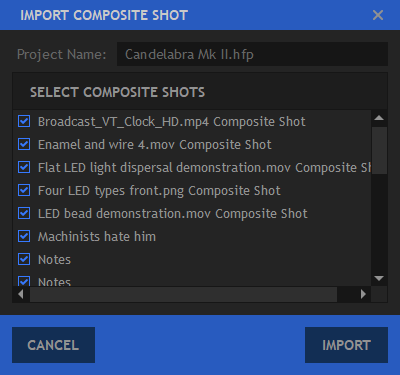 Importing composites would benefit from options like "select all" and "unselect all" (currently all are selected by default which I really don't care for!). It would also be nice to be able to highlight one shot, hold shift and then highlight another and all the shots inbetween so as to select or unselect all of those at once. Also, keyboard shortcuts to switch focus between the different panels including (but not limited to) the preview and timeline panels. You still have to address the hardware you have in your computer when dealing with Hitfilm’s responsiveness when scrubbing the timeline, with or without effects. What would be a useful option is for Hitfilm to automatically reload the frame after you export it. To the Media Bin. Vegas does this and it's very useful. After all, why would you be exporting it in the first place? Most likely to reimport and use as a Clean Plate/Freeze Frame. If you didn't want it in the project it's quicker to delete it than have to find and load it. But, make it an option. The Options list is fairly short, there are lots of other things that could benefit from being toggles. edit: reimported to the media bin, not the timeline. +1 to Palacono's suggestion where an Exported frame is reloaded--to the media bin. Not necessarily to the timeline. I'm that guy who isn't exporting frames to reimport for freeze frames, but it would be useful to those who do. To clarify my earlier comment, I am also of the opinion that frames should be reloaded to the media bin, but not the timeline. Hadn't occurred to me that it could mean adding to the timeline. The In and Out markers to 'magnetically' snap to the ends of clips when dragged with the mouse. It's very fiddly to have to zoom all the way in to make sure you're not either losing the last few seconds when you make your selection in the Editor, or including some empty space which will show as black on the export. Becomes more and more necessary as projects get longer and you're likely to be zoomed out further to get it all in. 1) In the Editor it makes cutting clips to a musical beat a lot easier. 2) In either the Editor or a Comp, the ability to give Hitfilm more time per frames to process them and play things back more smoothly and completely without having to RAM Preview (still not an option in the Editor ), or lower the resolution to see all the frames. I'd rather I could see all the steps of an animation at 1/4 speed slowly (if that's as fast as Hitfilm can manage it on a particular hardware setup, for example) than only see every 4th frame in 'realtime' as Hitfilm discards frames it can't draw in time. Granted: sometimes it might still have to play at 1/10 speed for really complicated shots (or modest hardware), in which case you'd set a lower limit for the speed you'd allow it to drop to and Hitfilm would do the best it could to draw the frames at the speed you set. So if it would need to play at 1/10 to show all frames, but you set the lower limit at 1/5: then it's going to play every second frame; which is a vast improvement on the 1 frame in 10 it currently does while trying to 'keep up' at the moment. RAM Preview in the Editor Timeline. Selective rendering in the Editor timeline. A bit like Proxy creation, but at Export quality settings. You've been able to do this in Vegas for years, so it's not a new idea, just needed now more than ever with detailed comps. It goes like this: you set a range in the Editor timeline where you want it to actually Pre-Render your clips. It chops up the range into manageable chunks of several seconds long. You can, if you're sensible, set the ranges so they span whole clip segments manually, or perhaps have an option where it will 'snap' the chunk boundaries to clip segments itself. Reasons why will be obvious later. It Pre-renders - using something like the Proxy mechanism as a background task (and I know it can do this because of an early Hitfilm Express bug: Exporting is thread-safe) - this section as you continue to do whatever else you want in Hitfilm using the remaining 80% or so of resources available to you. As you work on the project: you've gradually pre-rendered it as you go and only the last few bits you change need to be done when you finally export it. The reason for dividing it into chunks is so that if you go back and change something, only the affected chunks get their Pre-renders deleted and so less needs to be done again when you're finished. So it makes sense to try not to place the chunk boundaries half way through a comp. You either Pre-render those sections again, or they'll get done at the end. Sometimes it might be worth duplicating the odd Composite shot if its used at the beginning of the project and then again at the end of a project and you make changes that would affect it, which would cause the early section to change and need to be re-Pre-rendered. But, as I'd bet most people work from one end of a project to the other, and never touch the early stuff again: you'd be fine 90% of the time and it would cut down massively on the render time for your final export. It would also need for the Pre-Renders to 'stick' to the clips they're part of. So if you moved a section of video from one place to another, then the Pre-Render would move with it. Subject to it moving only whole Pre-render 'chunks' and probably having to discard things either side, such as a transition Pre-Render between other clips that are no longer there. This is how Proxies work anyway. You proxy the file and can use it anywhere. Which also leads to: Grouping. The ability to tag several video clips and treat them as a single entity when sliding, or cut'n'pasting them about on the Editor Timeline. Caveats would be: Choose an Export Quality and Resolution that is adequate for the project early on (maybe even higher than you need: see later), as if you change your mind half way through: it'll have to re-Pre-render everything (but that's just like it does now anyway). Other caveats might be: treating audio and video separately, as you might edit all the visuals, then go back and add in appropriate sound effects or music later. I'd still bet merging in audio to already-rendered video would be a relatively trivial task and a lot faster than now..
Others might be: Layers could be set to be excluded from the Pre-Render; so that if you add text/titles etc. on a layer above something that's been already done, then that would not invalidate the Pre-Render and it would instead be combined with it on the final export. If you want to export in multiple resolutions and qualities, like 1080p and 720p for the same project: then Hitfilm would either have to take the 1080p version after it's been rendered and transcode that to the 720p version (best option) or render it all again at 720p (hopefully not necessary). So make sure the 1080p version is at the top in the Export queue so it's got something to work from for the 720p version. Alternatively you might want different qualities and the same resolution, such as 1080p 35Mbps for archiving, and 1080p 12Mbps for YouTube. ; in which case Hitfilm would again use the output from one export file as the import for the other and just transcode from one to the other. You also might not want to do this for your whole project, just that particularly complicated 20 layer particle explosion 3D Model section in the middle. Or even a part of it, if it's made of multiple comps. But once you've got it sorted, is there any need to render the whole thing again when you change a minor detail elsewhere? @Triem23 amirite with the multi-hour exports for your tutorials? Oh, and if all this was done; then you probably wouldn't need RAM Preview in the Editor quite as much; as you'd be playing back the final export version most of the time at full speed. But add RAM Preview to the Editor anyway, as Transitions can be particularly taxing between even semi-complicated comps. @Palacono Average tutorial export has been about 90 minutes... BUT... *ahem* I don't edit my tutorials in Hitfilm, I edit in Vegas Pro... And, Vegas Pro 15 lives up to it's promise of faster export speeds. By rendering the same project in Vegas 14 and 15 I certainly show almost 100% increase in render speeds, so I now expect render times of about 45 minutes. @Triem23 are you even using Vegas's PreRender option? @Palacono nope. I do events mostly, and, of course, tutorials. Anything I'm bringing in from Hitfilm was rendered as an image sequence. Anything I'm editing in Vegas is usually subject to being moved at almost any time, so pre-rendering (for me) is just a great way to use up more drive space. Maybe if I did more commercial or narrative stuff where large sections would get locked down I'd use it, but it's not advantageous for what I do, generally. Especially as I tend to cut sections, spaced out on the timeline. Once a section or chapter is done I group all it's clips, then I start shuffling chapters around until things are in the order I want... THEN I'll place intros and outros, etc, etc. In general my entire timeline is subject to major movement at any moment. @Triem23 OK, fair enough. I usually find there is at least something that's not going to move, so if I take a break and I'm not doing anything else (making coffee, loo break), I'll set it rendering the odd little bits. A nice addition to Vegas's method would be the ability to slide bits around and they retain their Pre-rendered status. Then you could do what you do and still have that Pre-rendered time advantage. OK, I'll add that to my wishlist requirement for Hitfilm above. @Palacono All depends on one's editing style. Like I said, narrative stuff, maybe I'll have things locked down, but event, never. Tutorials--well, ok, those have a template file set up, but, even then, the only thing that I KNOW isn't going to change is the opening titles. Not worth the prerender time for 30 seconds of 35mbps mp4. I know this has been mentioned many, many times before, but do add some +1s to it and it might move up the stack. Soloing layers so I don't keep on selecting others and moving them by accident, even when their visibility is off. Locking layers so I really don't keep on selecting them by accident and moving them. Yes, I'm aware that if we still don't have this there is an exceedingly slim chance of getting Pre-renders, but no harm in aiming high.